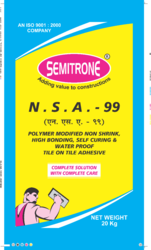 Leading Manufacturer of semitrone nsa 44, semitrone nsa 777, semitrone gma, max add grout, polymer modified tile adhesive n. s. a. 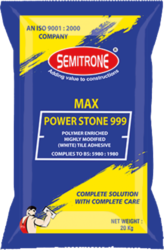 99 and max powerstone 999 ( the ultimate bond adhesive) from Ahmedabad. Polymer modified pre-packed adhesive for multipurpose application. N. S. A. - 44 is a non-shrink adhesive, self curing and having excellent waterproofing properties. It is specially made for Interior cladding of Ceramic Tiles, Vitrified Tiles, Mosaic Tiles & Plaster Work. 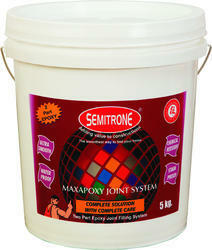 - Ideal for any cementitious surface to fix new Ceramic, Vitrified and cementitious tiles. 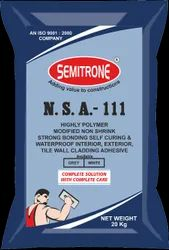 SEMITRONE N.S.A-777is a high performance, highly polymer modified cement based tile adhesive with excellent bonding properties with various kind of tiles including glossy surface after minimum treatment. It is specially designed for kota, granite and other heavy stone cladding' application, high flexibility and very good water proofing characteristics . 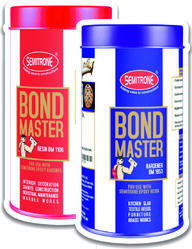 Enriched with dry bonding agents. 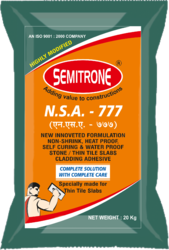 SEMITRONE N.S.A-777 is highly suitable for fixing Granite, Kota stone, and other stone and all tiles including glass bricks and glass mosaic/Glass bricks, recommended for interior and exterior elevation area due to high flexibility and bonding. 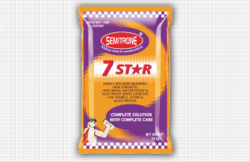 Add SEMITRONE N.S.A-777 to clean water and mix until a smooth slump free consistency produced or as per recommended ratio, avoid excess water. After mixing spread the adhesive paste on the background immediately. Spread only adhesive mix that can be fixed within 20 minutes. Use notched trowel. GMA is a high performance & highly polymer modified pre packed special high quality white adhesive. 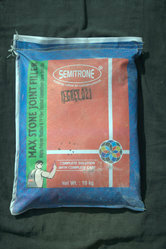 It is used for permanent fixing of Glass Mosaic & Glass Tiles application. GMA is a non shrink, heat proof, self curing and highly flexible adhesive having excellent waterproofing properties. It is specially made for Glass Mosaic & Tiles applications etc. It is both for exterior and interior applications. u Ideal adhesive for wall, floor, showers area, dry and wet areas, swimming pool etc. MAX ADD GROUT is an acrylic co-polymer emulsion that has been specifically formulated for the addition to MAX JOINT FILLER (GROUT). The grout admixture will significantly improve the bond strength; provide higher density resistance to thermal shock and flexibility of grouts. Because of its acrylic base, this liquid can enhance a grout’s appearance through better colour retention and less fading caused by ultraviolet rays. It is excellent for grouting tiles with high absorptive levels, 7 % or better. Increases weather resistance of grout. Increases durability & high bonding. Pour 100 ml of MAX ADD GROUT with 200 ml of clean water into a clean container. Add the MAX JOINT FILLER powder slowly continuously mixing until a smooth toothpaste consistency is achieved. Allow to stand for 2 minutes. Re-stir. The product is now ready to use. You can also use MAX ADD GROUT as a total water replacement in the grout. ü Ideal adhesive for wall, floor, showers area, dry and wet areas, swimming pool etc. MAX POWERSTONE999 is a high polymer added best performance , highly modified white adhesive. Which produce viscous paste when added with water. It is a single part product used for permanent fixing of Marble, granite , other stone & various Tiles . Max Powerstone999 is a non shrink, heat proof, self curing and highly flexible adhesive having excellent waterproofing properties. It is specially made to obtained ultimate bond for Stone & various Tiles applications at both areas - for exterior and interior applications. Polymer modified pre-packed adhesive for multipurpose application. N. S. A. 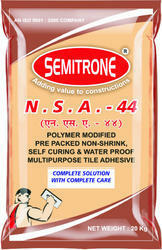 – 44 is a non-shrink adhesive, self curing and having excellent waterproofing properties. It is specially made for Interior cladding of Ceramic Tiles, Vitrified Tiles, Mosaic Tiles & Plaster Work. Max Block mortar is highly polymer enriched Ready mix Mortar needs to add clean water at site to prepare paste mortar, its quite easy to use, its specially designed for regular and hollow block masonry , brick masonry, and cracks between concrete and bricks etc to obtained best performance due to improved tensile strength and high bonding . The surface must be clean,sound and free from any free contaminants. During acceptable temperature wet the existing surface / block before applying Max Block Fix It must be applied during temperature more then 5 degree to 35 degree to obtained best performance. 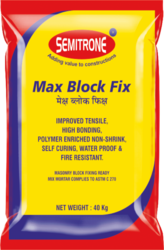 Apply the Max Block Fix paste mortar on block surface with trowel, press gently taking care that contact made proper with both the surface with mortar. Remove the excess material with wet sponge or cotton cloth before it gets set. Wear goggle and gloves and avoid skin or eye contact. Clean the eyes with plenty of water if eye contact done and seek medical attention. Protect the newly applied material from sunshine and wind. Packing Max Bloc Fixispacked in50kgpaper bags. Its made from ISI grade cement, graded silica and polymers to have improved workability with best performance. 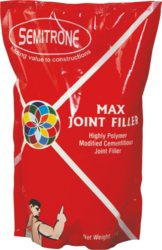 MAX JOINT FILLER is a blend of specially selected cements, fillers, high grade pigments and synthetic organic polymers. It is polymer modified highly water resist, peel proof and crack proof tile joint filler available in more than 36 attractive colours. Suitable for up to 4 mm width. v Bathrooms & Swimming pool etc. Mixing Ratio: Approx 0.32 to 0.34 % by weight of joint filler i. e. 1.6 to 1.7 liter water per 5 kg joint filler. v Tile joint must be clean, free from any dust or other contaminates. v Fill the joints after minimum 24 hours from tile fixed with chemical. v Wait for ten minutes for proper chemical action. v Fill the joint properly. v Clean the extra joint filler from tile surface with wet cotton cloth after 1.5 hours. v Clean the joints with dry cotton cloth after 24 hours. Available in 500 gm, 1 kg (Pouch & Jar) & 10 kg bag. NOTE: Price may vary depending on the requirement of quantity. v Pavers Flooring, Parking area, etc. 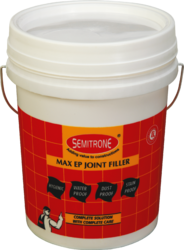 Mixing Ratio : Approx 0.32 to 0.34 % by weight of joint filler i. e. 1.6 to 1.7 liter water per 5 kg joint filler. Available only in 10 kg bag. High performance & highly polymer modified pre packed special high quality grey adhesive. It is used for permanent fixing of Granite and Stone application. N. S. A. 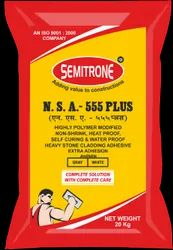 – 555 Plus is a non shrink, heat proof, self curing and highly flexible adhesive having excellent extra adhesion & waterproofing properties. It is specially made for Granite, Marble, Stone, Vitrified Tiles flooring etc. It is both for exterior and interior applications. It compiles to BS 5980 : 1980. SMART BONDERON-SITE MIX FOR INHANSING THE STRENGTH AND WORKABILITY OF CEMENTSmart Bonder is economical on-site mix additive to be mixed with cement, for fixing tiles & Cement Plaster.Smart Bonder exhibits very high water retention and thus reduces the absorption of water in to porous substrates.It provides workability, sufficient sag resistance as well as appropriate setting time. The adjustability is good even at low dosages and high ambient temperatures. It makes cement self-cured.Features¿¿¿ Improves adhesion¿¿¿ Good adjustability time with high water retention even at elevated temperature¿¿¿ High open time & anti sag properties¿¿¿ Excellent waterproofing properties.¿¿¿ Suitable for Ceramic, Vitrified tiles, Granite, Heavy Stone etc.¿¿¿ Suitable for Cement plaster.¿¿¿ It can be used with both grey and white cementBenefits¿¿¿ Economical solution for tile fixing¿¿¿ Easy to use, no special tools required¿¿¿ Low VOC environmentally safe¿¿¿ Exceptional bonding properties, compared to the traditional conventional MachanCoverage:2.0 - 2.5 sq. ft./ 1 kg (Mix of Cement : Sand : Smart Bonder : Water) at 3 mm thickness1.0 - 1.2 sq. ft /1 kg (Mix of Cement : Sand : Smart Bonder : Water) at 6 mm thicknessCoverage would depend upon porosity of substrate.Packing: 300 gmShelf LifeFactory sealed pack of this product are guaranteed to be best quality for one year from the date of manufacturing, if stored off the ground in a dry area. 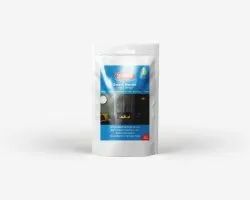 *High humidity will reduce the shelf life of the bagged productSafety PrecautionAll products should be used in accordance with manufactures instructions. No responsibility will be takenby the manufacturer where conditions of use differ from manufacturer’s instructions. The coverage figure/ yield etc.,are given for guidance only and actual field trials are recommended to ascertain the exact consumption/coverage. Looking for TILE ADHESIVE AND POLYMER JOINT FILLER ?